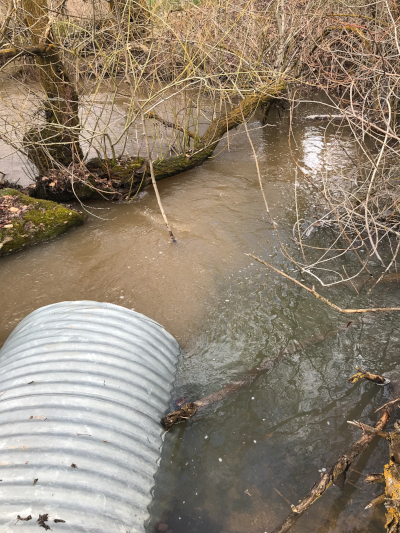 On April 8, 2006, Cottonwood Creek reached its highest flow in the 16 years the current US Geological Survey (USGS) stream gage has been in operation. At 78 cubic feet per second (cfs), the flow was more than twice as high as the second highest peak flow recorded on January 17, 2011. In 2006, the water rose quickly from a daily mean of 18 cfs on April 3 to a daily mean of 74 cfs on April 8. The water receded more gradually, dropping below 10 cfs on April 19. 78 cfs is more than three times the highest flow yet in 2019. 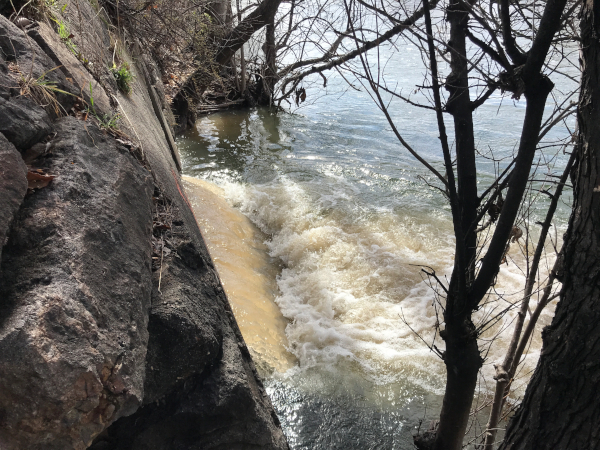 On March 28, 2019, the gage reported 18.7 cfs, the highest flow yet in 2019. The Cottonwood Creek gage is located high in the watershed, near Fivemile Creek. The USGS cooperatively operates it with City of Boise. Real-time data from the gage is transmitted via satellite to alert emergency managers of dangerously high flows. The current flow doesn’t pose a flood risk, but it’s very fast and people should stay out of the channel. The March 28 flow was the 5th highest flow in 16 years. In addition to the 2006 peak flow, high flows are as follows: January 17, 2011, 30 cfs, February 12, 2014, 25 cfs, and April 1, 2017, 20.7 cfs. The flow has exceeded 10 cfs in only 7 out of the 16 years. This year the flow has remained more than 10 cfs for two weeks. You can check the current flow here. The Cottonwood Creek watershed is steep and much higher than Boise. At its uppermost divide, the elevation is 6,000 feet and the average basin elevation is over 4,000 feet. More than half the basin has slopes greater than 30 percent. Because the high elevation receives greater snowfall than in town and also captures more rain, the average annual precipitation in the basin is about 20 inches. It also has a large area of surficial volcanic rocks. As a result of its topography, geology, and climate, it accumulates snow in the winter that can melt off quickly in the spring, raising creek flow rapidly. Some of the water soaks into the aquifer beneath the creek and this stored water returns to the creek after the initial peaks subside. Water seeps out of the aquifer to the creek in the late spring and early summer, until the aquifer water table drops below the stream bottom. Cottonwood Creek is typically dry in the late summer, with the exception of heavy thunderstorms that can cause flash flooding. Cottonwood Creek flows under Mountain Cove Road into detention ponds. March 28, 2019. On March 28, Cottonwood Creek was brown with sediment. The fine sediment moved with the creek through the retention ponds all the way to the Boise River. A later trip to upstream sections of Cottonwood Creek revealed that the quick snow melt and heavy rain of March 27 and 28 caused significant erosion of Shaw Mountain Road. That could be the cause of the high sediment load. 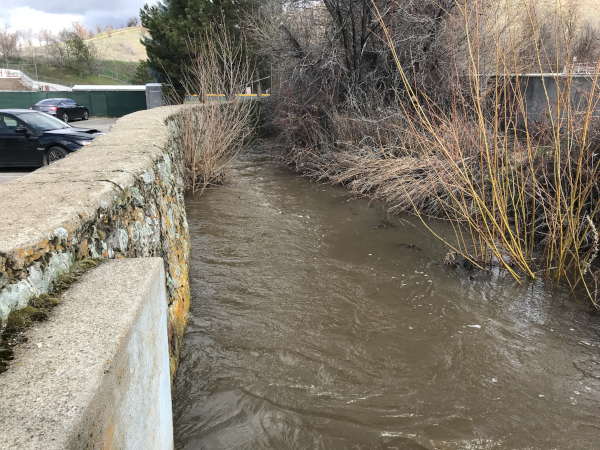 Sediment-laden Cottonwood Creek flows into the Boise River March 28, 2019. 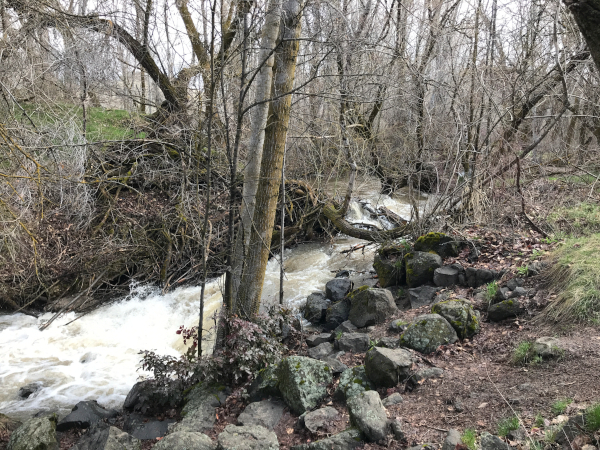 View 10 short videos of Cottonwood Creek taken on March 28, 2019 on the BREN YouTube channel. The still photos don’t do it justice. Read about historic floods in Cottonwood Creek. 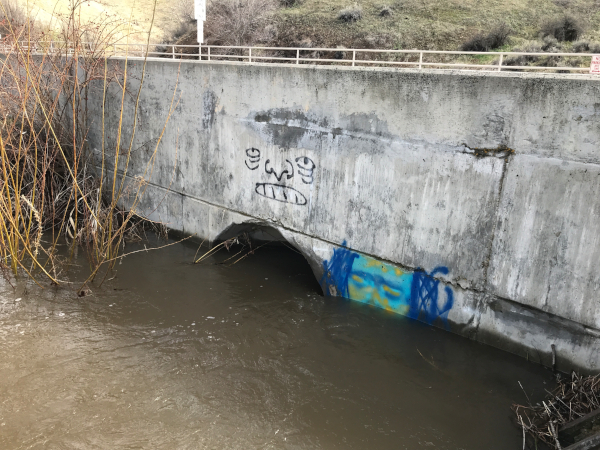 The Boise River Enhancement Network is a partner in a cooperative project to daylight Cottonwood Creek where it flows through Julia Davis Park and enters the Boise River. The creek currently runs through a stone flume under the park. A new natural creek channel will be constructed benefiting fish and wildlife, water quality and park visitors. The project leads are City of Boise and Trout Unlimited and partners include the Intermountain Bird Observatory, Ada County Highway District, Golden Eagle Audubon Society, and Land Trust of the Treasure Valley. The project is funded, in part, by the US Bureau of Reclamation, the City of Boise Open Space and Clean Water Fund and the Idaho Foundation for Fish and Wildlife. All photos by Liz Paul.